An entry of 120 cull cows at Markethill on Tuesday, July 17th sold in a steady demand. Beef bred cows sold to £135 to £171 per 100 kilos for 698k Limousin at £1,195. 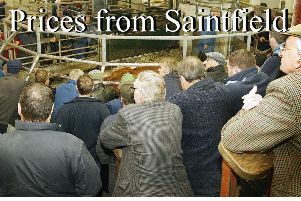 Cows/heifers to £196 per 100 kilos for 510k at £1,005. Fleshed Friesian cows sold from £113 to £121 for 750k at £915 and 720k at £965. Second quality Friesians from £90 to £105 per 100 kilos and the poorest types from £60 to £80 per 100 kilos. Aghalee farmer 512k, £1,005, £196.00; Kilkeel farmer 698k, £1,195, £171.00; Markethill farmer 676k, £1,045, £155.00; Newry farmer 624k, £955, £153.00; Keady farmer 672k, £975, £145.00; Markethill farmer 722k, £1,035, £143.00; Banbridge farmer 602k, £855, £142.00; Newry farmer 676k, £945, £140.00 and Armagh farmer 864k, £1,175, £136.00. Camlough farmer 754k, £915, £121.00; Scarva farmer 796k, £965, £121.00; Newry farmer 800k, £965, £121.00; Kilkeel farmer 574k, £685, £119.00; Scarva farmer 634k, £755, £119.00; Keady farmer 644k, £755, £117.00; Poyntzpass farmer 708k, £825, £117.00; Banbridge farmer 716k, £825, £115.00 and Banbridge farmer 760k, £875, £115.00. Good quality bulls from £250 to £430 for a Limousin and good quality heifers from £200 to £380 for a Limousin. Limousin £430; Aberdeen Angus £290; Simmental £290; Aberdeen Angus £275; Simmental £270 and Aberdeen Angus £250. Limousin £380; Limousin £320; Aberdeen Angus £290; Charolais £275; Limousin £255; Limousin £240; Limousin £240 and Aberdeen Angus £200.